Giveaway has ended! 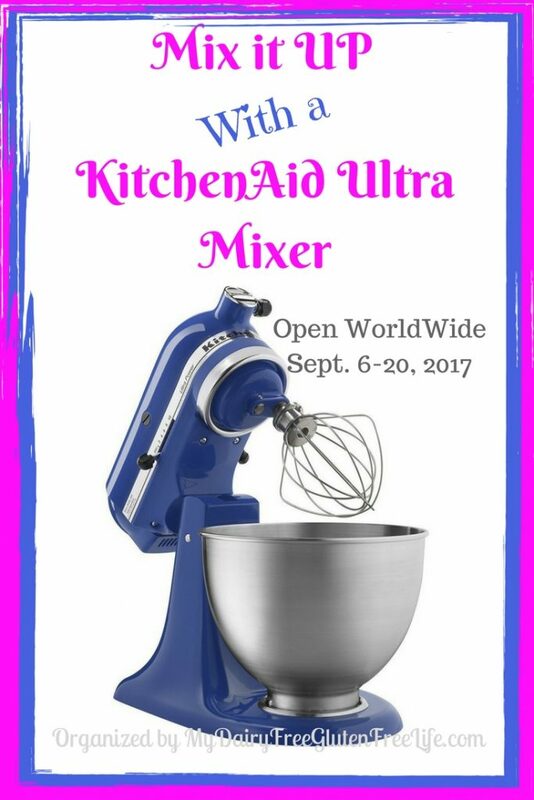 Congratulations Wendy F.
I am so excited to be able to give ONE lucky reader this FABULOUS Kitchenaid Ultra Power Stand Mixer! Are you feeling lucky?? One lucky reader will soon be mixing up all kinds of goodies with a Kitchenaid Ultra Power Stand Mixer! The winner will have a selection of colors to choose from, so if you aren’t into blue you can choose your own color! I am so excited to bring you this KitchenAid Giveaway! This event is a Blogger Sponsored Event which means the bloggers listed below have donated to cover the cost of this Kitchenaid Ultra Power Stand Mixer! Budget Earth, Full Belly Sisters, Conserva Mom, Moore or Less Cooking, Coupons and Freebies Mom, Fountain Avenue Kitchen, and Bandit Lifestyle. The tilt-head feature and generous 4-1/2-quart capacity make the KitchenAid Stand Mixer the ultimate in user-friendly design. Features 10 speeds and KitchenAid’s unique planetary mixing action, driven by a powerful 300-watt motor. Rugged all-metal construction ensures long life and quiet operation, and rubber feet anchor it securely while in use. This mixer has a 4-1/2-quart stainless steel bowl, but it can also accommodate the 3- and 5-quart bowls. This giveaway closes September 20 at 11:59 PM Eastern Standard Time. The prize will be available to US only. If the winner is from outside of the US they will be paid the cash value of the prize via PayPal. This is such a great giveaway! I love to bake but this would make it so much better! I have this on my Christmas list!!! Oh gosh it would be thrilling to win!! Please please please!!!! Let me beg like a dog at the dinner table!!! I could do so much with a kitchen aid Mixer! My favourite food to make with a Kitchen Aid mixer would be to make bread dough. My shoulder doesn’t allow me to do all the kneading and mixing it requires. I would LOVE to have a Kitchen Aid mixer!!! Kitchenaid mixers come in handy when your family gets together during the holidays to make cookies and candies. My favourite food to make with a mixer is cake (a lot of things I just use a spoon for). I gave my old kitchen aide mixer to my daughter 10 years ago while we were living in very smal quarters & she won’t give it back!😃 When I brought it up she went out a bought me a mixer…a hand mixer…so after about 10 years I need a new one for myself…would greatly appreciate it!!! I enjoy your posts on FB. I would like to see more side vegetable ideas. LOL It’s the hardest thing to get your family to eat. I have SO many recipes I would try with the mixer. I would love to be the lucky winner. My favorite thing to make would definitely be cakes and cupcakes. Great giveaway. I will share on my page. I would make cinnamon rolls with a new KitchenAid mixer. My favorite food to make with a mixer is cheesecake. I lost my mixer and blender in my divorce. Used it every week to make something different.. Would live a new mixer and KA is the best. Looked at the colors and I am in love with the espresso colored one. I don’t own one, would love to win this, would make my baking a whole lot easier. My Dream Mixer, just in time for the Holidays!! I so want to win a new KitchenAide mixer before my 45 year old one decides to stop working in the middle of a recipe! Doing things like this is getting harder and harder by hand as I get older I would love a mixer! Oh I have coveted one of these for so long!! Thank you for this opportunity. I find so many great recipes. I get tired of my same old standards. Awesome blog! cakes and pies are so much easier to make with one of these..
What a wonderful prize for a lucky winner! I use a lot of your recipes for dinner. I love to bake! I mostly make cakes and cookies with my mixer. It is on its last leg so a new one would be awesome!